‘Act of Passion’ is written from the point of view of a younger middle-aged man, a doctor, on trial for the murder of his young lover. It is an admission of guilt, and it is quintessential Georges Simenon but even more nasty and vile than most. .
Simenon is psychologically astute on how the humans in his stories misbehave. They can behave terribly yet we perfectly understand them and their reasons for doing so. 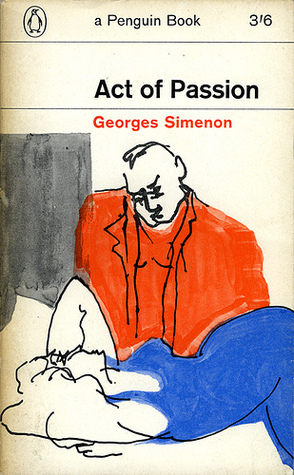 Although several characters in the previous novels of Georges Simenon which I have read have been abhorrent, the doctor Charles Alavoine who first-person narrates ‘Act of Passion’ is by far the most repulsive Simenon character of all. He beats up his young lover Martine with whom he is having an affair on the side, and he gives as his justification that he wants to beat the bad out of her and return her to her innocent girlhood. Ultimately he murders her by beating and the novel is the account he gives after his trial. I suppose Simenon’s reason for writing a novel about this evil doctor is that such men do exist and this is real, but I am not sure that is sufficient. It is too honest and squalid to be uplifting. The doctor’s wife Armande is too perfect in everything she does. “Do you realize how discouraging that can be? It is like being married to your schoolmistress.” He feels the need of deceiving her as sordidly as possible, so he finds Martine who is a big young blonde with a vulgar smile. Martine is a professional, has been with a number of men. The doctor’s affair with Martine continues. He claims he loves Martine but wants to return her to her innocent girlhood state by beating the bad out of her. Ultimately he beats her up so hard she dies. His wife Armande testifies in his defense at her trial. I can usually separate my reactions to a horrible and violent story about wicked people from my judgment of its literary quality, but this time I can’t. This is sordid. In fact, I don’t understand why people like to read this sort of thing at all. Simenon probably dealt with a lot of horrific crimes in his Inspector Maigret novels, but having the murderer write about it in the first-person probably makes it worse. I have just bought the Rowan Atkinson series of Maigret, mostly because I was curious to see him take on a role so different to Mr Bean. But I also have two Simenons in French: Le Passager du Polarlys and Les Inconnus dans la Maison. I picked them up for a song at the French Festival here in Melbourne, because I remembered how my Indonesian improved when I read Agatha Christie novels translated into Indonesian. I’d read all her novels long ago (in English) but I couldn’t remember whodunnit so I just had to keep reading to find out. Rowan Atkinson. I thought that the Black Adder was wonderful, but am not so excited about his work since then. I hadn’t known he had done Inspector Maigret, that might be fun. Yes, I liked Black Adder too… it’s been running on iView recently and has ben fun to watch since missed most of it the first time round. AG is hilarious to read in Indonesian. Though Indonesians are as keen to stratify their society as anybody else, there is no Indonesian equivalent to the English county house and its class distinctions, and of course all the huntin’ and fishin’ and dinin’ that goes on bears no resemblance to anything in Indonesia either. I had great fun with it. Wow, you read Indonesian! I’m impressed. Of course Indonesia is one of Australia’s closest neighbors. This does sound grim, even as far as Simenon is concerned. Have you read Dirty Snow? I thinks that’s the most disturbing one I’ve read to date. Unremittingly bleak. I did read ‘Dirty Snow’, and I was not repulsed by ‘Dirty Snow’ like I was with ‘Act of Passion’. When I read ‘Dirty Snow’, I applauded Simenon for plunging into the dark side of life. 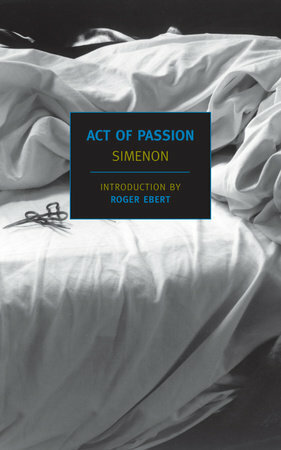 However now I criticize Simenon for jumping too far into the dark side with ‘Act of Passion’. First up, I really didn’t like Atkinson as Maigret, but maybe that’s just me. I love the Maigret books but the non Maigret Simenon books I’ve read have been very dark and you do get to a point where you wonder why you’re reading about such awful people. Perhaps I’ll just stick to the Inspector! I have not read an Inspector Maigret book yet. Maybe that’s my problem. I am one of those prissy types who read only real ‘Literature’.